Learn the secrets to projecting baseball player performance and dominate your fantasy draft!In Projecting X: How to Forecast Baseball Player Performance, FanGraphs expert Mike Podhorzer takes you on a journey through the process of projecting baseball player performance. As he walks you through an assortment of both basic and advanced metrics, citing various pieces of relevant research along the way, you will learn the whats, whys and hows of each statistic.After becoming an expert on analyzing the statistics and metrics used in forecasting, you will discover how to use those newly acquired skills. A complete step-by-step tutorial on developing an Excel spreadsheet to perform the calculations follows, as well as examples of the forecasting process in action as Mike guides you through a hitter and pitcher projection. The year was 1984 and had Big Brother been looking over my shoulder, he (or is it “they?”) would not have been happy, but probably would have understood. I was 17, and though I was a big fan of Bill James and his annual Baseball Abstracts, I was not passionate about math and decided to eschew anything that resembled it while compiling my list of baseball’s best hitters. 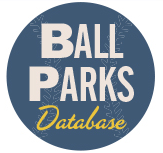 My idea of spending long hours on a train bound from Vancouver, Washington to Brookline, Massachusetts (no, I’m not kidding) was to break out my Street & Smith’s and rank every hitter in every batting statistic, add up their score and list them in order. It was like golf in that the best hitters had the lowest scores (1 point for leading the league, 2 for finishing second, etc.). In later years I continued to treat math like the plague, but it was a necessary evil when it came to projecting players over the course of a full season. Of course, I used the simplest math I could and based my projections on the completely arbitrary total of 550 plate appearances regardless of injury history or typical spot in the batting order. Take a guy like Johnny Blanchard circa 1961, for example. He had 275 plate appearances, belted 21 homers and drove in 54 runs in 93 games. The simplest of math shows that one need only double Blanchard’s totals to come up with a full season’s worth of stats. Not so fast, says Mike Podhorzer’s book Projecting X: How To Forecast Baseball Player Performance. Apparently there’s a much more complex and accurate way of projecting performance other than simple division and multiplication. (Yes, I knew that; no, I didn’t know exactly how to do it until now). Right off the bat, Podhorzer admits that it’s difficult to predict playing time because of position battles, injuries, recovery timetables and other variables. Of course, it becomes clearer as the season progresses, but for fantasy baseball players it’s important to get a jump on the competition before the season starts, at least as far as the draft is concerned. 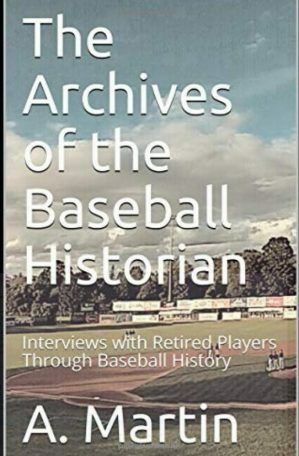 Podhorzer shows in his first chapter—Projecting Hitter Performance—that my 550 plate appearance assumption was wrong, that a healthy full-time regular will amass anywhere from 600 to 750 plate appearances in a season (except catchers, who are more apt to record between 450-600). 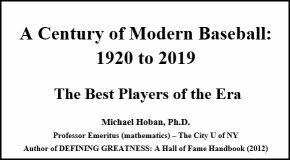 From there he discusses doubles and triples; strikeout percentage; ground ball/line drive/fly ball rates; batting average on balls in play (BABIP); home run per fly ball rate; RBIs, runs and stolen bases, and how each correlates from season to season (for example, doubles and triples don’t correlate “very highly” from year to year, whereas K% has an “extremely high” year-to-year correlation). He also provides benchmarks to guide you while formulating projections. Chapter 2—Projecting Pitcher Performance—covers pitchers and uses stats such as innings; strikeout and walk rates; ground ball/line drive/fly ball rates; BABIP; home runs per fly ball rate; and saves. He provides correlations and benchmarks for this chapter as well. Chapter 3 is where the fun begins, as Podhorzer explains in detail how to create a spreadsheet that will make projecting player performance much easier. As Podhorzer explains in his introduction “the forecasting process requires a combination of both art and science,” and this is where some knowledge, judgment and tweaking comes in to play. After you enter Mike’s formulas into their respective cells, Chapter 4 explains how to develop a “Hitter Projection.” The information that goes into some of the cells is easy to calculate and starts with three years of data. For example, Miguel Cabrera’s plate appearances from 2010-2012 have been fairly steady (648, 688 and 697), so Podhorzer suggests 685, which isn’t exactly a three-year average, but is very close and takes his age and spot in Detroit’s batting order into consideration. Entering data into that specific cell will cause the at-bats (B2) and BIP (U2) cells to automatically fill with projected stats. From there, Podhorzer goes through the rest of the process and gives reasons why some averages should be tweaked and what to take into account, such as first pitch strike percentage to determine a K% average (don’t worry, the author provides links to web sites that carry this information). Finally, he explains how to create a spreadsheet for projecting pitching stats and how to develop a projection. One of the cooler features in Podhorzer’s book is the runs per game each team is expected to score in 2013, which impacts a pitcher’s wins and losses. He uses Detroit ace Justin Verlander as an example—with the Tigers’ expected runs per game, Verlander projects out to a .643 winning percentage, but with the Marlins’ expected R/G he’d be a .536 pitcher. And the great thing is that once you add the data below to your spreadsheet, all you have to do is change the three-letter team abbreviation under the “Team” cell (B2) to see how a pitcher’s wins and losses will or would be impacted in the event of a trade. At only 39 pages, Projecting X is a quick and easy read, and if you’re a spreadsheet nerd like me you’ll particularly enjoy creating sheets using Podhorzer’s formulae, then punching in numbers to get projections (I said I don’t like math, I didn’t say I don’t like entering formulas created by others). 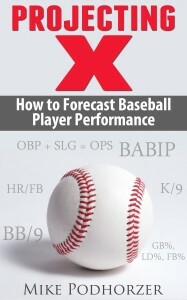 Whether you’re into fantasy baseball or just enjoy creating projections, your money will be well spent if you download a copy of Mike Podhorzer’s Projecting X: How To Forecast Baseball Player Performance. The Expected Runs per Game chart above was posted with Mike Podhorzer’s permission. The numbers are a few weeks old, so it might be best to double check the three sources before using them. 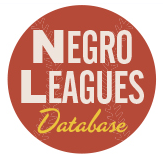 They’re from Baseball Prospectus (BP), Clay Davenport (CD) and Replacement Level Yankees Weblog (RLYW). Links to the three are provided in the book. Disclaimer: I was provided with a free copy of the book being reviewed by the publisher, and we are also an affiliate.